The USHCC National Convention is the largest networking venue for Hispanic businesses in America. For over a generation, the USHCC has served as the nation’s leading Hispanic Business organization, working to bring more than 4.2 million Hispanic owned businesses to the forefront of the national economic agenda. 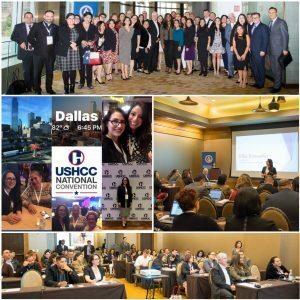 Our National Convention brings together thousands of Hispanic business owners, corporate executives and members of more than 200 local Hispanic chambers of commerce from across the country, offering the opportunity to establish strategic, long-lasting business partnerships through dialogue, matchmaking and learning. USHCC National Convention highlights and presentation for 2017 Wells Fargo Local Chamber Grant Award.